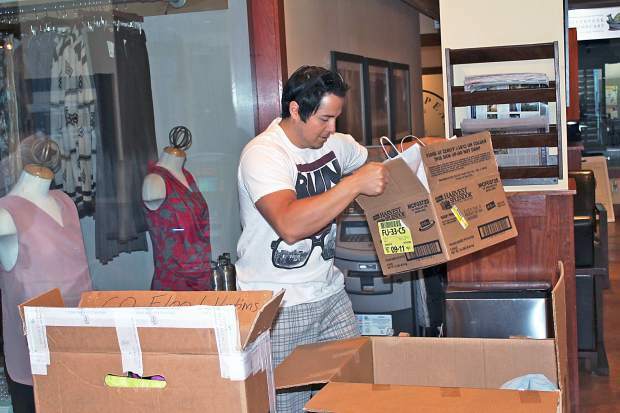 Mike Nakagawa collects donations at 520 Grill on Thursday. The Aspen resident later drove to Boulder to drop off donations for victims of the flood-stricken area. During the Denver Broncos game Sunday afternoon, Aspen resident Mike Nakagawa got to thinking about the constant flood coverage in northern Colorado after seeing homes swept away and numerous residents injured. In that moment he decided it was time to do something more important than sit on the couch and watch another football game. Late last week, Colorado was hit with catastrophic floods reaching for 200 miles across 17 counties in its northeastern region, according to the Colorado Office of Emergency Management (as of Thursday). The city of Boulder experienced a substantial amount of flooding. Water covered the streets and sidewalks, rocks and debris filled the sewers and homes were destroyed. Seeing what was happening, Nakagawa knew he had to do something to help. So he took action turning to the social media-site Facebook seeking donations for those affected by the floods. Social media have proven to be powerful tools for Nakagawa, whose post Sunday night received immediate reaction, just like a similar one he posted last year to help the victims of Superstorm Sandy. By Thursday morning, Nakagawa had filled his truck to the brim to make his delivery to the Boulder Creek area. And it didn’t take long to find local businesses to serve as drop-off locations. The Meatball Shack, Wells Fargo, 520 Grill and the Innsbruck Luxury Condominiums offered to serve as drop-off locations in town. The Westin Snowmass Resort also pitched in to offer more donations, and the community of Carbondale organized donations for Nakagawa to pick up on his way out of town. Blankets, clothing, backpacks, canned food and cases of water began to fill the many boxes the businesses set up. By the time Nakagawa hit the 520 Grill, his last stop in Aspen, he knew he would have to pack in the bags carefully to make sure nothing flew out of his truck on the drive. Aidan Wynn, manager of the Meatball Shack, has organized a fundraiser in addition to being a drop-off location this past week. The fundraiser will take place at the Meatball Shack starting at 4 p.m. Monday, lasting through the Broncos game. Wynn has communicated with many restaurants and businesses in town to provide prizes for the raffle tickets the restaurant will be selling. Prizes include gift cards to restaurants, ski passes and even tickets to a Broncos game, to name a few. The fund-raiser came together quickly, and Wynn expects to have a huge turnout. Abby Margulis is an editorial intern working at The Aspen Times this fall. She is a junior at DePauw University in Indiana.